Before you decide this dessert should be served during happy hour…or in place of happy hour…relax. This will not land you a DUI or any need for bail money. All of the alcohol does bake out. Although I’m not quite sure how I feel about that. 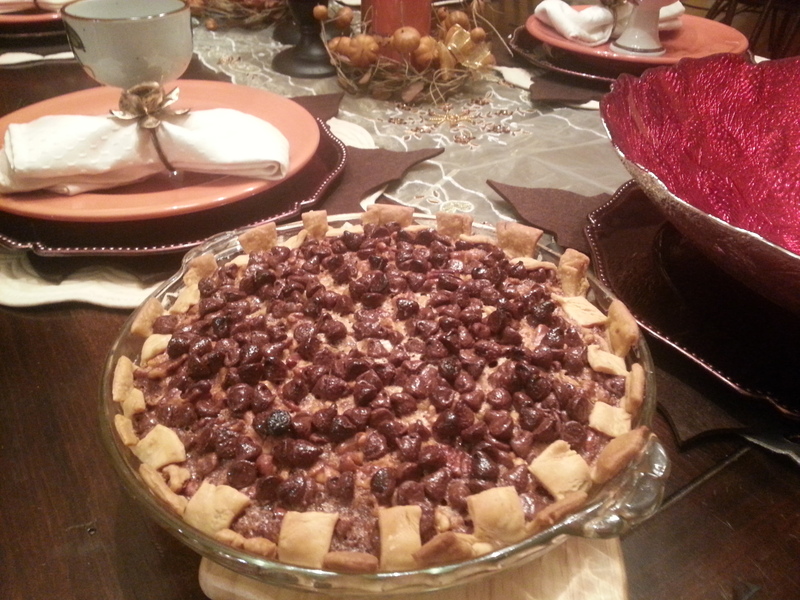 This pie is a really nice alternative to your traditional pecan pie. 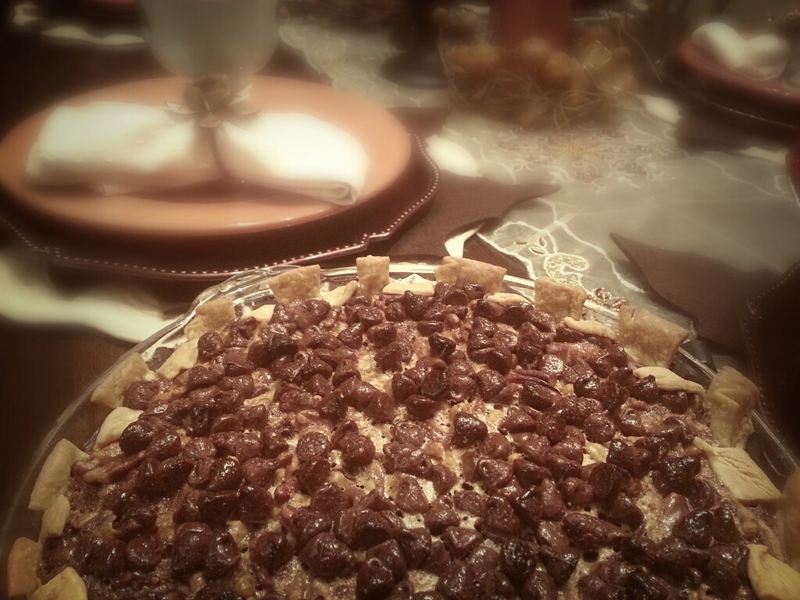 There is a beautiful blend of both pecans and walnuts with a traditional pecan pie filling…with a twist. Enter chocolate and Kahlua. Now, the crust really is a traditional pie crust. Well, except it calls for just a wee lip nip (1/4 cup) of vodka. Not more than a few shots really. OK. OK! You’re right! This ain’t granny’s pecan pie. But I sure think she would have approved. We all know granny really enjoyed the communion wine. 😉 Mogan David’s move over! Preheat oven to 375 degrees F. Prepare above crust. Wrap pastry circle around rolling pin; transfer to a 9-inch pie plate. Ease pastry into pie plate without stretching it. Trim pastry to 1/2 inch beyond edge of pie plate. Fold under extra pastry. Crimp edge as desired. Do not prick pastry. Sprinkle with the 3/4 cup chocolate pieces. For filling, in a medium bowl, combine eggs, corn syrup, brown sugar, melted butter, coffee liqueur, flour, and vanilla. Stir in the 1 cup chopped pecans. 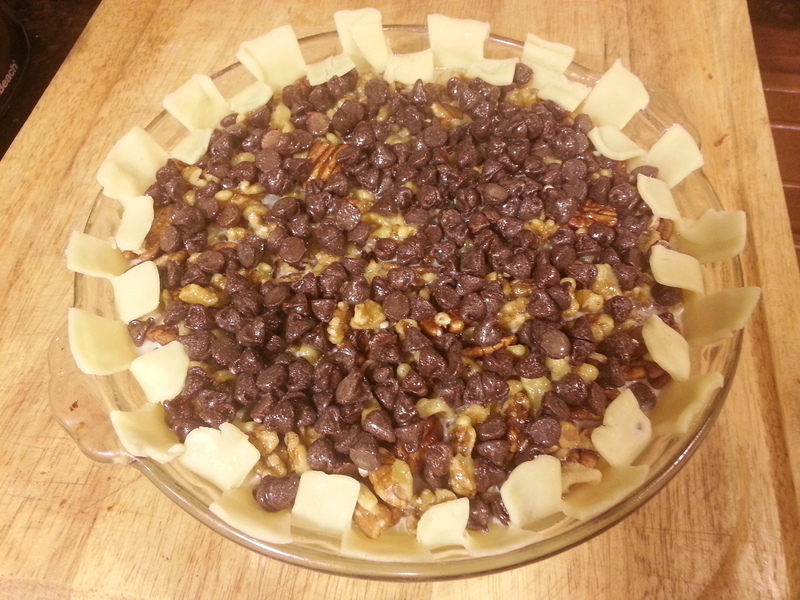 Slowly pour filling over chocolate pieces in crust, spreading evenly. Cover edge of pie with foil to prevent over browning. Bake for 25 minutes. Remove foil. Bake about 10 minutes more or until edge is puffed and a knife inserted near the center comes out clean. Cool on a wire rack. Cover and chill within 2 hours. If desired, prepare Coffee Whipped Cream before serving. 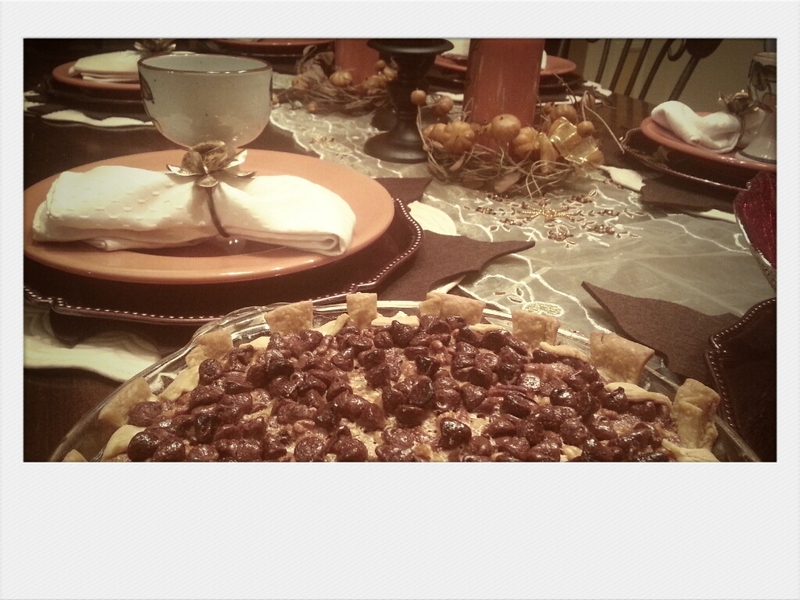 Garnish pie with the melted chocolate and the pecan halves. Spoon the whipped cream on top of each serving (if using). Makes 8 servings. Easy as pie. I like easy. I like pie.